WorldMUN has turned into a must- visit conference for ETH MUN. 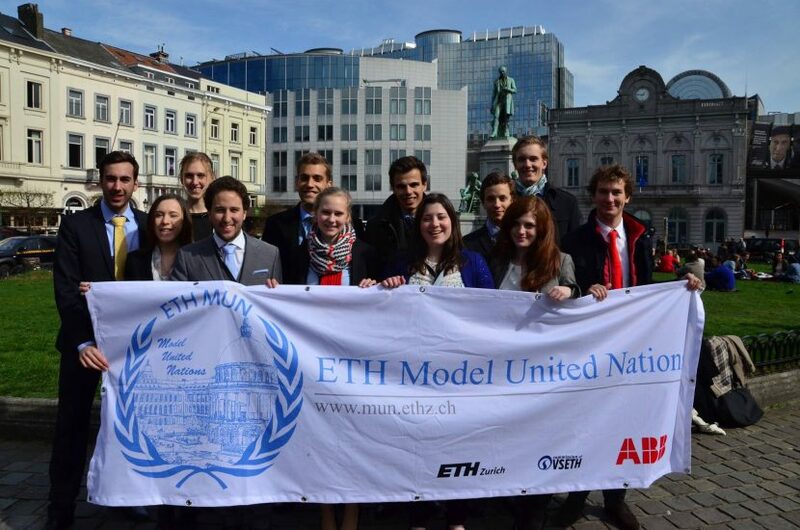 This year ETH MUN participated at its sixth WorldMUN in Brussels, Belgium, representing Peru. Why six times WorldMUN? WorldMUN is the most international and largest university-level MUN conference of the year. Each year, it takes place in a different part of the world and is organized by Harvard University together with a host university of the conference location. The vision of WorldMUN is to create an environment in which participants meet, get to know, discuss and socialize with as many delegates as possible and which makes you conscious of what living in one international community truly means. Besides four days of intense debates, WorldMUN organizes common dinners and themed social events to foster friendships to every place on the globe. This combination makes WorldMUN one of the most remarkable conferences every year. This year ETH MUN sent 12 delegates in a very diversified team of junior and senior members to participate at ETH MUN in Brussels, Belgium. The event was kicked off with a grand opening ceremony in the “Bozar”. Distinguished guest speakers were the President of the European Council, Herman Van Rompuy and UN Special Rapporteur Olivier De Schutter. Committee sessions were held in the beautiful Egmont Palace in downtown Brussels. The range of topics was endless, anything from “Usage of drones without a declaration of war” in the huge Disarmament and Security Council up to “Improving Access to finance” in the specialized World Bank committee was discussed in one of the 19 committee sessions. The first night started off with Global Village at which every delegation had a chance to represent their home country by serving local food and other delicacies. This was a great chance to try Chinese rice cookies after sipping Peruvian rum while talking to Australians. Subsequent social events were themed “Surrealism” or “Comic Book Heros” and turned out to be the best time to finally talk to friends and co-delegates on not committee related work. The Swiss Ambassador to the European Union, Roberto Balzaretti, also invited ETH MUN to the Swiss EU Mission. During the meeting Mr. Balzaretti elaborated on the impact of the “Einwanderungsinitiative” on relations between Switzerland and the EU. In an intense discussion, the importance of the EU for Switzerland was addressed and delegates had the chance to ask questions. The final closing ceremony, organized in the ostentatious “Koekelberg Basiclia” was the official end of the WorldMUN experience for our delegates. Two of our delegates, Nathalie Wandel and Antonio Cherubini, won a “Diplomacy Award” for representing the spirit of diplomacy through active debate, negotiation and compromise throughout the conference. All our delegates suffered from the post WorldMUNblues. Having spent one entire week with an overloaded schedule, continuously discussing and socialising, returning to your normal daily routine seems impossible. However, the spirit of WorldMUN has infected us and we all look forward to next year’s seventh time of ETH MUN’s participation at WorldMUN.